Each species has to have a unique scientific name. How does one decide the name for a new species? The most common way is to try to give it a name that tells something about the plant. For instance how it looks, where it grows or when it flowers. Water-violet that grows in still water is called Hottonia palustris. 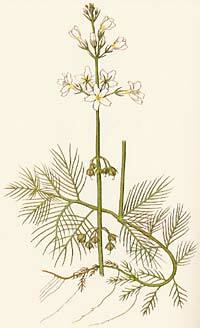 The species name palustris means ”growing on wetland”. Mistle thrush, which lives of mistletoe berries, is called Turdus viscivorus. The species name viscivorus means ”mistletoe eater”. It still happens that scientists name species after persons they want to honour, for example prominent scientists or teachers. It is also common that the person who first found a plant has in named after him or her. Whatever name a plant has, it is always exciting to translate the name and try to figure out why it got its name. Do you know a plant called Linnaea borealis and why it is named as it is?